This week's featured pattern designer is Pamela Leggett from Pamela's Patterns. I have bee very fortunate to work with Pamela for the past three years selling her wholesale fabrics for Steve's Sewing and Vacuum (you will read about that below!) I've even been in her fabulous studio! Threads Magazine featured her sewing room about a year ago and let me tell you, it is a gorgeous as the photos show! Enjoy learning a little bit about Pamela and her journey through the industry. I grew up in Michigan where both my grandmothers and mom did many types of handcrafts: sewing, knitting, crocheting, painting, weaving, beading. My mom was a great teacher and encouraged my love of sewing. I actually started earning money with my sewing skills at age 14! I’ve had many types of jobs, all related to sewing, design, teaching and business. Hands-on work was my “college”. I’ve been teaching since 1981, and it is my true passion. I love working with women. Women who sew are so giving and inspiring. When you teach, you get to hear all their amazing stories. I spent 22 years in Connecticut where I raised my two children. My daughter sews beautifully and uses her skills to sew for people she cares about. I have four wonderful grandchildren who make me laugh all the time. I married Bill in 2005 and moved to the Philadelphia area. He has two teenage daughters who live with us part time. My work life consists of teaching locally, traveling to teach, running Pamela’s Patterns and working for publishers such as Threads Magazine. I just finished a serger DVD with Threads called Fashion Serge, which will be released in the Fall of 2014. We are also working on a serger book/DVD combo, which will be released in the Fall of 2015. I have three aspects to my work life. Traveling – When I am traveling to teach, I have to prepare several weeks in advance so that products can be shipped to the location. The day before I leave is when I get my class plan together and pack. Once I get to the location, I have to set up my “Pamela’s Patterns Store” and get all my multi-media equipment set up prior to students arriving. Teaching all day makes it worthwhile! Then break everything down, pack it up and travel back home. Sometimes I am at the location for several days. Teaching at Steve’s Sewing in King of Prussia, PA – This is where I teach locally. I am usually teaching there 24+ hours per week. I teach a variety of classes, private lessons and guide classes. I am also responsible for purchasing, maintaining and merchandising the fashion fabric carried in the store. hat I get to sew all the time, but that is actually the hardest part to make time for!! I am the instructor for the Palmer/Pletsch East School of Sewing where we teach a hands-on way to fit commercial patterns. Most of my customers have mature figures. I was fascinated at how the body changed as it matures. It didn’t seem to matter what the weight of the person was, it was the curves and scallops that were different. Commercial patterns are made for a youthful figure. I wanted desperately to make patterns for the changing figure so women would feel empowered to sew for themselves and be happy with the results. I never went to a formal school for design, but I have always studied and taken classes with sewing educators I admired. I made custom patterns for students in my classes, but I was not a professional pattern maker, just self taught. In 2004, I decided to make three of my standard patterns into a multi-size pattern to make it easier on me when I was teaching. I had to learn how to grade the patterns, add graphics, print, make instructions, photograph and package. It was way more work than I thought! My editor at Threads Magazine ran a story on the patterns, and all of a sudden I was a pattern designer! I want them to be simple to make, easy to fit, and a classic style that one would wear every day. I leave the complicated and super fashionable patterns to others! I love the detailing, fabric and styling of Tahari. I try to go into their showroom at least once a year for inspiration. The clothes are beautiful on the inside as well as the outside! The best thing is the teaching – it’s what makes everything else I do worthwhile! The interaction with other women is amazing. We all learn so much from each other, and not all of it is about sewing! The hardest thing is delegating and time management. I don’t know if I will ever get that totally right! I love the #105 The Perfect Tank Top and the #109 Magic Pencil Skirt. I love working with the Palmer/Pletsch patterns available in McCall’s. They have all the pattern markings built in for fitting. I am a huge fan of Stretch & Sew, even though they are no longer in business. I learned so much from working with those patterns. I am excited to see the young independent pattern designers today. I hope they keep doing it! I definitely have a love affair with knits and stretch wovens! I really like wool knits, they come in so many varieties of weights that you can wear them all year round. Silk of any kind are also faves. That would have to be my rotary cutter and mat. I also have a love affair with drafting and quilting rulers – I can never have enough! Spending time with my grandchildren would be my favorite! But I also love movies, books and theatre. And the ocean! Most common fabric question – Where can I get good knits? I tell them Fabric Mart, of course! Most common sewing question – What is the best way to sew on knits? I have lots of info on that! 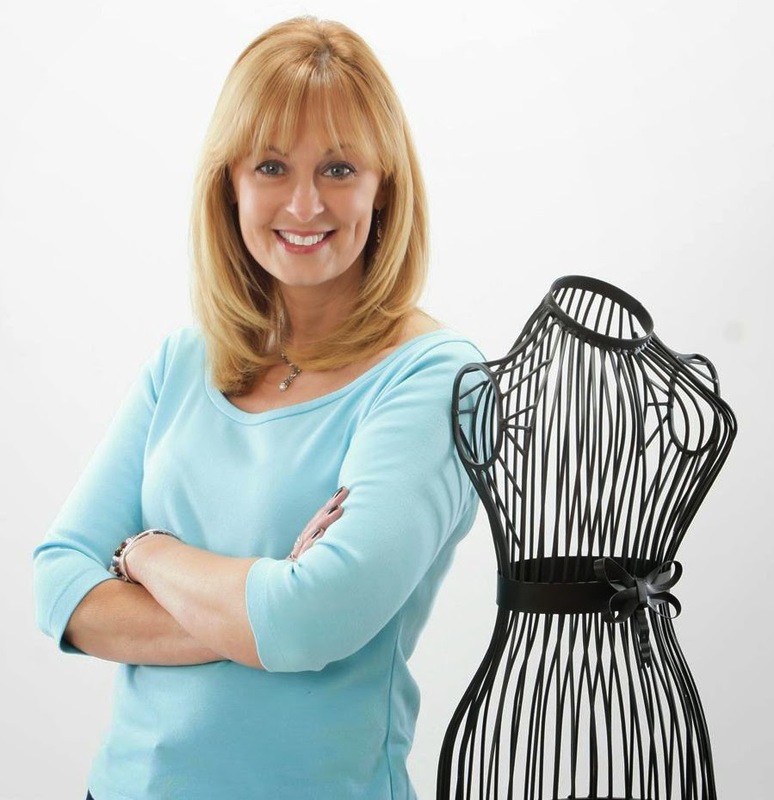 Just check out Pamela’s Patterns website for YouTube tutorials, downloads, DVD’s and patterns! I love all the draping, ruching and color blocking. I hate people who where leggings like pants! I’m working on two new patterns. The Pretty Peplum Top is made for knits and can be made with a jewel, scoop or keyhole neckline. The Softly Pleated Dress or Tunic is also made for knits and has a slightly elevated waistline and very small gentle pleats to hide tummy and “fluff”. Both garments are a lesson in proportion. They look great on all figure types once the proportion is correct! The patterns are just about ready to be sent to the printer, and then I have to finish the instructions, have the cover photography done and do a few YouTube videos. Making the pattern is just the first step! Thanks Pamela for giving us an inside view of your busy life! I know I'm really excited about the new sewing patterns. Can't wait to buy some for our website too! 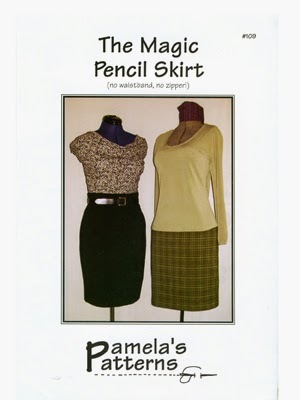 Click here to view our selection of Pamela's Patterns on our website. Wonderful interview! 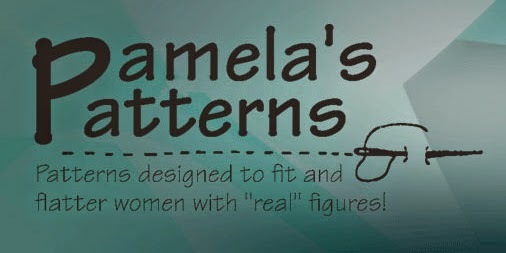 I'm a long time fan of Pamela's Patterns as they fit my mature figure so well! Thank you for sharing with us. 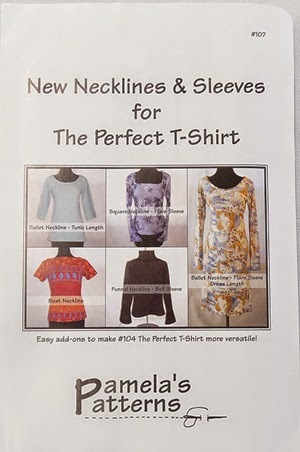 I have started to sew clothing again after taking some time off, I love Pamela's patterns, b/c once fitted well,all I have to do is look for new inspiration ( which is all around!) and then make up my version of what I would like it to be. The patterns are indeed simple, if you take the time to fit correctly, No one would know that re using the same group of patterns in many diff ways affords one so many many looks. I use her patterns primarly for dressier outfits and have worn patterns of hers to the opera, symphony and plays. Now that she has the new pants pattern out( and DVD) I will expand into some more casual clothing . I have a difficult time fitting myself bc I am a small person, It takes less time for me to cut and sew a pencil or bias skirt than it does to go shopping and try to find a well made outfit. I did just come across this article by accident since I am looking for inspiration for sewing her patterns and am very glad to hear she is coming out w/ 2 new patterns soon! My sewing time for myself is valuable, I also am learning to quilt for my grandchildren, so her patterns work well for me , fit me well, and also are not so overly complicated and frustrating that I can spend other sewing time for the grandchildren. BTW, I love her new slip/ undergarment pattern, It surely is worth the time to invest in this pattern also! I will be sure to share this with Pamela! I will be seeing her tomorrow :O) I'm sure she will be flattered! I live in Pamela's pencil skirts. I've lost track of how many I have.